I set off from dear, dirty Harwich town up into the prim outer suburbs and then to where it got rough again to find this church open. In fact, the outer doors were latched open back, and it wasn't until I was actually inside the porch that I saw a sign which said We are sorry that the church is not open to the public today because of children's activities. And yes, you could hear them inside, being active. So, all I could do was to photograph the exterior, and a number of interesting headstones. This is a good medieval church rather done over - the building was encased in cement render in the 1920s, which caused damp to soak into the nave and chancel. Only the top of the red brick tower has been revealed so far in more than twenty years of trying to put it right. It looked a bit battered, and I wondered what the inside was like. One of the helpers came out for a breath of fresh air, and we got chatting. He confirmed that the church is usually open every day, and that this children's thing was a one-off. But I'm sure they won't mind if you want to take a look inside, he said. Looking down at my camera, I assured him that they would. He agreed reluctantly. I came back a few Saturdays later. At first I thought the church was locked, because the outer grill was closed and I could see the padlock. But coming closer I saw that it was only on one gate, and so I opened them and then the inner door. There were three people inside, two of them cleaning, the other one a woman fiddling with paperwork. "Is it possible to take a look around?" I said, and of course yes it was, as it always is. A rather sad interior, shabby but also with a richness of an 18th Century restoration. The east end is delightful. "Of course, Dovercourt was here before Harwich was", said the female cleaner. I think she is probably right, although this directly contradicted what the sitter at Harwich St Nicholas had been keen to impress on me. A most curious window of the works of mercy is an 1890s near-copy of the 1637 window at Messing I'd seen the previous Saturday. Every window other than this filled with poor quality 1880s glass from a minor workshop, except for two tiny lancets, one with a William Morris figure and the other I think by the York Guild. The great survival here is the medieval rood beam, decorated with vinework in the early 17th Century and inscribed with the date 1615. At this point the male cleaner said "I suppose you know you're lucky to see inside?". It turned out I had been entirely misinformed. This church is ordinarily kept locked without a keyholder. "Sadly, that's the way of the world nowadays." 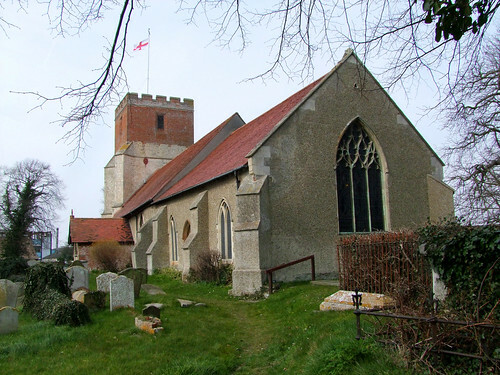 When I pointed out that quite clearly it was not the way of the world nowadays, given that the vast majority of Essex churches are left open every day, I was countered with "well, we couldn't possibly leave it open in a place like Dovercourt". It struck me then that you could head west from here, up the Stour Estuary, along Essex's long border with Suffolk, its border with Cambridgeshire and then deep into Hertfordshire without finding a single other locked church. But I didn't say so.